Coaching is one of the most often missed opportunity for managers to develop their teams and those around them. Every day, you have opportunity to coach. Formal coaching, informal coaching, instant coaching - all at your disposal but often missed. We define coaching as facilitating the learning of others to help reach their unique potential. It's all quite simple really. However, it's about doing simple really well that is the challenge. Training and coaching are ​​normally the responsibility of the line manager, both aimed at improving current and future performance. The difference is that training is essentially telling the individual what to do whereas coaching is asking them how they would do it. Both aimed at achieving the same performance expected. The Johari Window. A great feedback approach. If you want to throw mentoring in to the mix, then mentoring is about the person rather than just their job performance. Being supported by someone with experience, wisdom and who can offer guidance, typically as a role model, will usually be a senior manager or an experienced trusted person..
the attention and can guide the younger players through the mentors personal experiences having gained that experience by playing at a similar or a highest level. We design and deliver tailored in-house coaching and mentoring skills workshops. We are also able to offer Chartered Management Institute accreditation. A great starting point is offering your inhouse people the CMI Level 5 Award in Management Coaching and Mentoring. Sharing and passing on inhouse wisdom, experience and helping to develop your people is an incredibly powerful development option. This is also proving to be particularly helpful for managers who need to support and develop candidates working on the new degree level apprenticeships as part of the feedback now includes 'behaviour'. Developing your managers and inhouse trainers to a highly regarded national qualification is a great way to demonstrate employer commitment to your people. To find out more, click on the button below or call us on 0121 366 87 99. Where possible, we also offer instant phone or skype coaching. For more information, click on the button. As a professional coaches, we follow the Global Code of Conduct as determined by the Association of Coaching and the European Mentoring and Coaching Council. 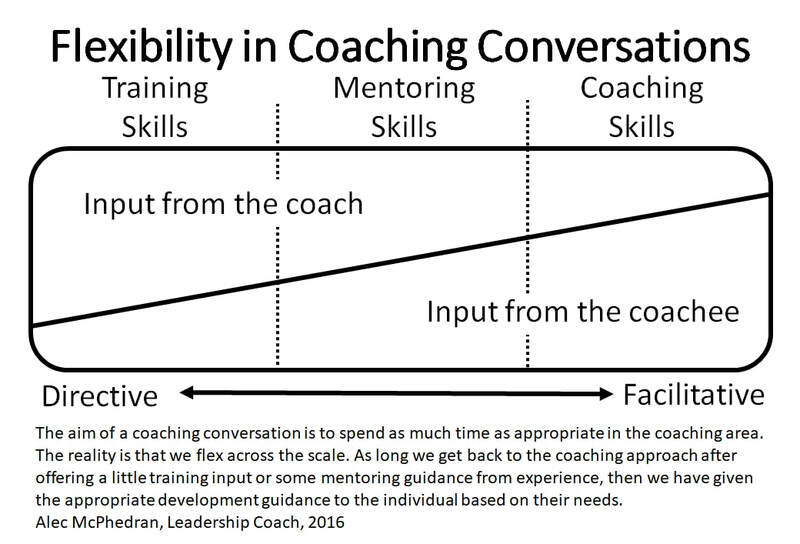 The Coaching Conversation Model is a tool to explain the way a coaching discussion may at times flex into training, teaching or mentoring mode as well as the ideal coaching approach. Here leading creative sector coach Alec McPhedran of Skills Channel TV explains the model to help new coaches appreciate the skill in flexing coaching conversations. When I was being trained to become a coach, much of the advice was to mainly use open-ended questions such as who, what, why, where, when and how. Equally to make use use of TED, tell me about, explain to me or describe to me, which are of course powerful open-ended questions. The aim therefore was to ensure that I the coach contributed very little by way of advice or influence to the coachee and that the answer sits within them. ​To continue, please click on the button below. Coaching is facilitating people to reach their unique potential. A coach should consider the effective management of the coaching process to reach session goals as effectively and as focused as possible. 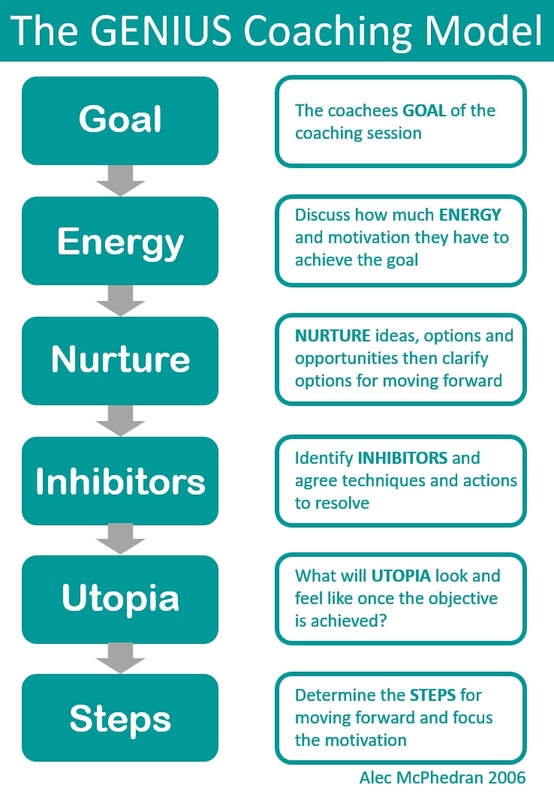 Alec McPhedran explains the simple to use but highly effective GENIUS coaching framework for creative coaching sessions. In essence, coaching is a simple process. However, we must make sure we do simple well. At its heart lies good questioning, listening and the ability to summarise. The challenges are building trust and maintaining a positive working and open relationship in which the coachee feels they are the focus of attention and that they are being helped to work on their ideas. ​To continue reading this article, please click on the button below.